Digitization help student to explore and study their academic courses online, as this gives them flexibility and scheduling their learning at their convenience. Kidsfront has prepared unique course material of Mathematics Triangles for NDA Exam student. This free online Mathematics study material for NDA Exam will help students in learning and doing practice on Triangles topic of NDA Exam Mathematics. The study material on Triangles, help NDA Exam Mathematics students to learn every aspect of Triangles and prepare themselves for exams by doing online test exercise for Triangles, as their study progresses in class. Kidsfront provide unique pattern of learning Mathematics with free online comprehensive study material and loads of NDA Exam Mathematics Triangles exercise prepared by the highly professionals team. Students can understand Triangles concept easily and consolidate their learning by doing practice test on Triangles regularly till they excel in Mathematics Triangles. The diagram at the right shows a right triangle with representations for two angles. What is the value of x? Two sides of an isosceles triangle measure 3 and 5. Which of the following could be the measure of the third side? 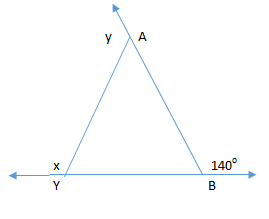 The midpoints of the sides of triangle PQR are labeled X, Y and Z. 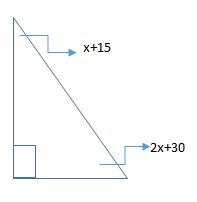 If the perimeter of triangle XYZ is 26, find the perimeter of triangle PQR. The sides of a triangle are 6, 8 and 12. Find the length of the longest side of a similar triangle whose shortest side is 18. 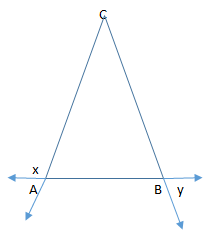 The vertex angle of an isosceles triangle measures ten times the measure of a base angle. Find the measure of a base angle.